Oh my gosh!!! I have been asking friends to take me out of SL, I went totally crazy with the sales. Lots of beautiful items from amazing designers for a special price. I went shopping as if there was no tomorrow. Some stores kept their prices down only on Friday the 27th, but most of the stores will be on sale for the whole weekend. So I'm not so late posting this. 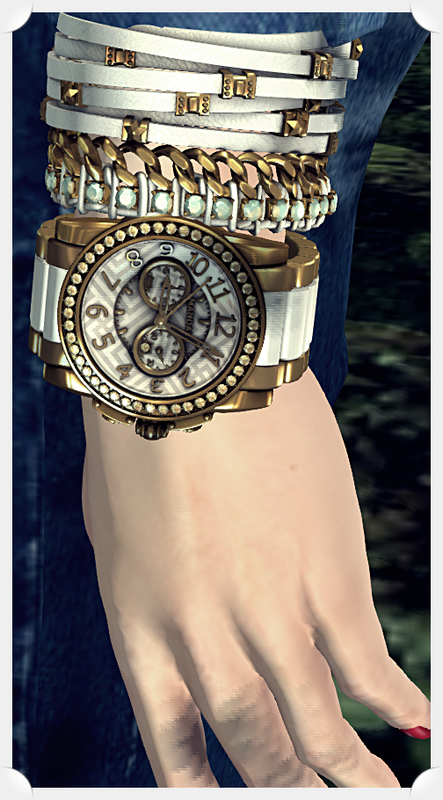 I am so happy that I have found the best watch ever in SL! I had been looking for it for a long time. I actually love everything at the Mandala store. Hair - Magika - 03 - Falling. Sale price only on Marketplace , more 7 hair styles are on sale there, check the link. Shirt - KITJA - Clea Denim Shirt D.BLUE. Sale prices only on Nov. 27th. Handbag - REIGN - VILLENCIA BAG - COGNAC, 50% off. Watch - [MANDALA] BILLIONAIRE_Fashionista (white). Cheaper on Marketplace for a limited time. Necklaces - [MANDALA] ONLIEST. Unisex. (Cheaper on Marketplace for a limited time). First and second pictures below were taken here. Handbag -...Mutresse... Mona Bag - 18 Colors @Collabor88. Also, previously blogged here. Boots - REIGN.- Moccasin Boots- Caramel. Pictures below were taken here.